The Results Of An Advanced Facial In Only 30 Minutes ! The results of professional HydraFacial treatment are maintained in between visits by using the HydraFacial Daily Essentials kit. The Daily Essentials contains a combination of serums used in the professional treatment and formulations that support your skin health. 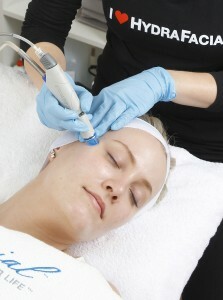 The HydraFacial performs a mild form of dermabrasion during the treatment but with far less risk of skin irritation than traditional treatments. And when combined with HydraFacial serums, and the wholistic multi-stage process above, the HydraFacial enters a class of its own. After hydradermabrasion, skin polyphenolic antioxidant levels were increased by 30%. However, manual application of antioxidants alone did not result in increased level of polyphenolic antioxidants. A series of hydradermabrasion treatments resulted in epidermal and papillary dermal thickening with deposition of new collagen fibers. A majority of patients reported significant or noticeable improvements in all of the surveyed skin conditions. Qualitatively, decreased pore size, decreased fine lines, and decreased hyperpigmentation were most commonly observed. HydraFacial treatments were also found to enhance the results of light-based skin rejuvenation treatments such as laser and IPL. With regular monthly HydraFacials the levels of antioxidants in your skin will build and the results of each treatment last for longer. The next time you are thinking of pamering yourself with a facial, try HydraFacial and experience the treatment that is adding a new level of rejuvenation with absolutely no surgery or downtime.